The Philadelphia Chapter is pleased to announce that Sean Williams of Philadelphia was selected to receive the inaugural Capt. Brian Kennedy, USMC Memorial Scholarship, which is to be awarded to a deserving Naval Academy Summer Seminar student in memory of Brian Kennedy ’07, a Malvern native who died in a training accident last year. Congratulations to Bill Squires ’75 on his election to the U.S. Naval Academy Alumni Association’s Board of Trustees for the Eastern Region! We look forward to hearing from Bill about USNAAA activities and initiatives as he serves his three-year term. This year cadets from Valley Forge Military Academy secured appointments to the U.S. Military Academy, the U.S. Air Force Academy and (best for last) the U.S. Naval Academy. Way to go VFMA cadets and Col. John Church, USMC (ret.) ’89, President of Valley Forge Military Academy & College! 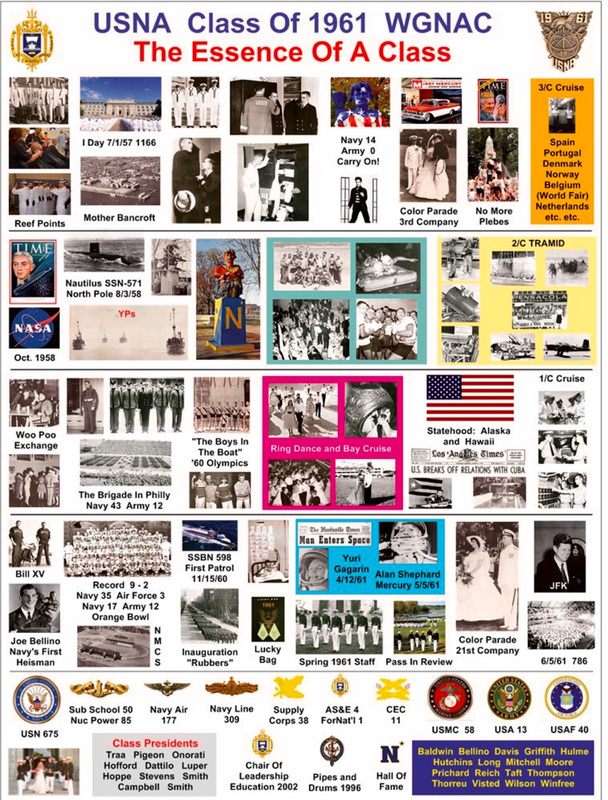 For his recent reunion, David Wright ’61 created this nostalgic poster depicting all the major events that transpired during his class’ time at USNA. For anyone interested in recreating something like this for your own reunion, of even for yourself, David’s happy the share the gouge if you email him. 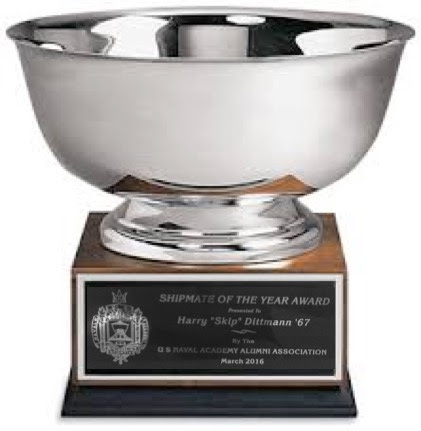 We are please to announce that Harry “Skip” Dittmann (USNA ’67) was selected among five finalist nominees as the recipient of the 2015 Byerly-Manion Shipmate of the Year Award! This annual award honors a person or group whose actions have significantly contributed to the furtherance of the mission of the Greater Philadelphia Chapter of the U.S. Naval Academy Alumni Association. A three-year varsity Navy Football player and former All-American, Skip’s Navy career entailed 33 years of active duty and reserve service. His service to the Chapter, the U.S. Naval Academy, and Navy Sports includes Selection Board Chairman for former congressman Joe Sestak, Director of the Navy League of Philadelphia, Trustee of United States Naval Academy Foundation, and Blue and Gold Officer. He is currently an Executive Committeeman of Philadelphia Sports Congress, which brought the Army v. Navy Soccer match to PPL Park and bids to host the Army v. Navy Football Game at Lincoln Financial Field, and serves as a board member of the Philadelphia USNAAA Chapter. GO HERE to learn more about the Byerly-Manion Shipmate of the Year Award, its namesakes, and past recipients.